At the same moment the man was burning a few days ago at Burning Man, Todd and I were just wrapping up a late-night Madrid tapa crawl with our friends The Baron and The Baroness. 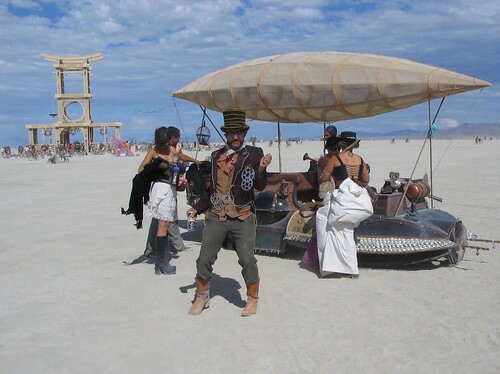 The Baron will have brief moment of fame soon, when Everywhere Magazine publishes my photo of him in full steampunk costume at Burning Man 2007. They only printed a thumb-nail sized version of the photo, but I was chosen and paid, which is grand. Everywhere Magazine is a wonderful photo-driven travel publication that is unfortunately closing shop after the next issue. So, check out Everywhere Issue 4 online or at your favorite local independent bookstore. As you may have noticed, since we’re spending most of our time running around Northern Spain with – coincidentally – The Baron and The Baroness, our dispatches will be less frequent for a couple of weeks. Leave a Reply to Eve Click here to cancel reply.